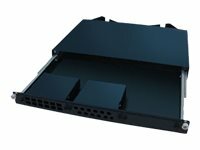 This is a 19-inch, slide-out patch panel, with a 1U chassis and 3 open cassette bays, which are customizable and interchangeable. This patch panel provides termination, connection, and management of fiber optic cables, and in a world where real estate is king, this is very important technology. When you only have so much space in your data center, why not this space-saving solution. The smart design provides firm protection for all your optic cables. This patch panel's 3 open bays are to be used with our MPO/MTP cassette's and/or blank cover plate, which are sold separately. Our Products are 100% compliant for all of your networking needs. Now you have a cost effective solution to your network upgrade needs.